China in recent years has been gaining ground on the West in the number of art collectors. Art collecting in China has been boosted by the country’s flourishing economy and rapidly expanding middle class over the last 10 years. With more disposable income, Chinese people have developed a strong appetite for luxury goods, overseas trips, and art collection. The United States and Europe no longer dominate the international art and antiques market. 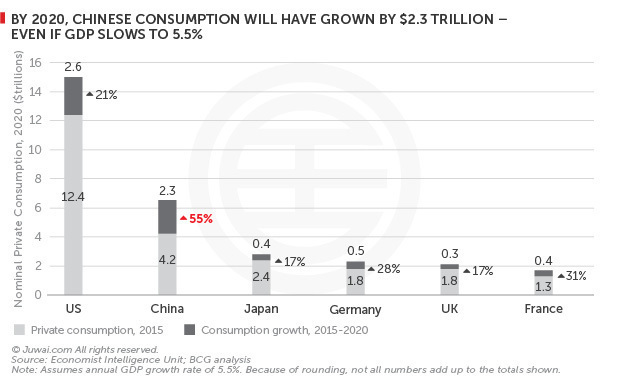 Driven by a $2.3 trillion increase in consumption by China’s middle-class between now and 2020, China’s consumer spending is projected to outstrip developed markets by 2020 – surpassing expected growth in the US, Japan, Germany, the UK, and France. More astonishingly is the fact that this is slated to happen, even if China’s GDP slows to 5.5%. Upper-middle class households refer to household whose annual disposable income ranges from US$24,000 to US$46,000, and affluent households, with disposable income over US$46,000, would double to 100 million by 2020. Art collecting in China has been boosted by the country’s flourishing economy and rapidly expanding middle class over the last 10 years. With more disposable income, Chinese people have developed a strong appetite for luxury goods, overseas trips, and art collection. Although Chinese art collectors are obsessed with the unique artistic appeal and investment potential of ancient or antique Chinese paintings and fine Antiques (include English Silver and Chinese Export Silver), a key weakness lies in the limited supply of top-quality artworks coming on to the auction market in China. As such antique artworks become fewer and more expensive in the domestic market, Chinese people head abroad for treasure hunting. Art and antiques are tangible investments that can be visually enjoyed while they create a monetary profit for those collectors who are willing to hold onto their pieces during the time their value gradually increases. A lot of Chinese people look at it as an investment rather than a hobby. But in China when compared to Western collectors, there are relatively few collectors who collect just out of passion. Such a mentality could has led to some very irrational speculation. Examples could include the recent Dzi beads. For us, we believed that Chinese Export Silver is slowly gaining recognition. Reader may also be interested to read our article on Investing in Chinese Export Silver. 1. Buy and hold: Chinese art is a long term investment due to its high price and low transaction rates. Investors should therefore be prepared to hold the asset for a while and look to realize considerable returns once its value goes up. 2. Buy low sell high: This is an investment strategy for those looking to take advantage of abnormal price movements in the art market and should benefit those who are willing to hold on to their asset long enough for this to happen.